On this day in 1923, Adolf Hitler and his nascent Nazi Party attempted to seize power in Bavaria in a bid to overthrow the Weimar Republic with the heart of action revolving around Munich’s largest beer hall. Weimar Germany was a hotbed of political strife and agitation. 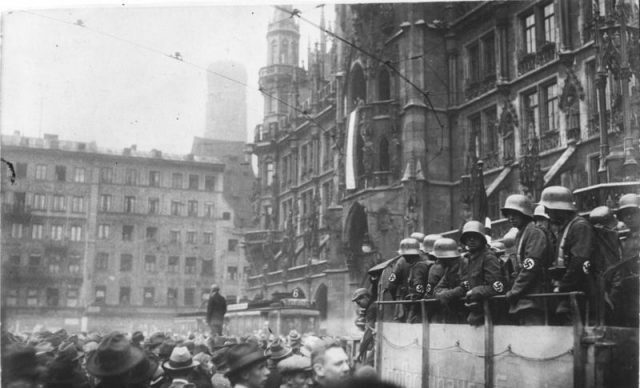 The end of the First World War caused huge turmoil in Germany which experienced a short but bloody battle between communist militias and right wing paramilitaries (Freikorps) known as the ‘Spartacist uprising’ in January 1919 followed by hyperinflation and its accompanying instability. Germany, recently made a republic by the abdication of the Kaiser, had a burgeoning communist party and an equally strong nationalist party all of which attracted more and more supporters in this febrile atmosphere, as Germans sought an answer and solution to the political, social and economic upheaval their country was experiencing. Indeed, Hitler’s own coup d’etat, although the most famous due to the cast of villains involved, was not the only ‘putsch’ to have taken place against the Weimar government, with Wolfgang Kapp having tried to oust the republic in 1920 in order to establish a right wing autocracy. Even if they did not adhere to one side or the other, the issues of the day were the hot topics in bars and cafés across the country. Munich’s beer halls in particular were popular places for socilaising and engaging in political debate and one of the largest and most famous was the Bürgerbräukeller. In November 1923 it was this hall that was the scene of the failed seizure of power by Adolf Hitler and the Nationalsozialistische Deutsche Arbeitpartei (NSDAP or Nazi Party). While Bavarian state commissioner Gustav von Kahr was making a speech in the hall on the evening of 8 November, in marched Hitler at the head of some 600 of his Sturmabteilung (SA) paramilitaries and various supporters such as Hermann Göring and Rudolf Hess. With the place was surrounded, Hitler declared the Bavarian government deposed. Soon afterwards, Ernst Röhm moved his freikorps out of another nearby beer hall, the ‘Löwenbraukeller’, to seize important buildings across the city. The aim of the coup or ‘putsch’ was to seize power in Bavaria and then use it as a base before a final march on Berlin where Hitler and the old World War General, Ludendorff would seize power and ‘save’ Germany from the communists. The whole thing was inspired by Benito Mussolini’s March on Rome in October the previous year, which had swept the fascist dictator to power on a wave of popular feeling, Italy being another country blighted by political extremes. The Bavarian adventure however ran into problems right from the start. The local police and army units responded quickly to reports of trouble and moved to intercept the Nazis. Röhm’s men were ambushed and although no one was killed in the ensuing fusillade, they fell back to the Löwenbraukeller and pro-government reinforcements were rushed in. Staying in the beer hall overnight, the next day the plotters realised their coup was going nowhere. In a bid to rouse the city to their cause they marched on the Defence Ministry but there ran into 130 soldiers and policeman who refused to give way to the 2,000 SA men Hitler had at his back. The two groups began shooting and the Nazis came off worse. Sixteen of them were killed and Hitler and Hermann Göring were lightly wounded. The rest of Hitler’s men scattered and Hitler himself was arrested two days later but his sentence at his subsequent trial was light. Unfortunately, this was not the end of the matter. Upon his Hitler’s release he built on the fame and support the putsch had given him and in 1933 became chancellor of Germany, leading that country, the rest of Europe and eventually a greater part of the world into the hell of second, total war. Hitler returned to the Bürgerbräukeller in 1938 on the anniversary of the putsch but, with his devilish luck, left the rally early thereby missing a huge bomb meant for him and which killed eight people instead. Reopened as a beer cellar after the war the site was demolished in 1978 and is now occupied by the Gasteig Cultutral Centre and Hilton Hotel.